Region: This pest can be found in southeastern United States and sometimes north to New York and west to Nebraska. Life cycle: It produces one to four generations each year. It hibernates as a pupa within a rolled up leaf, and the adult moth emerges in late spring. Physical description: The 3/4 inch Caterpillar is yellowish white with dark marks when young, turning greenish with a brown head as it ages. The adult moth is a slender, yellowish white to tan insect with long hairy scales on the tip of its abdomen. This moth has a wingspan of 1 1/4 inches. The very small white eggs are laid on buds, leaves, stalks and fruits, in small amounts or singly. 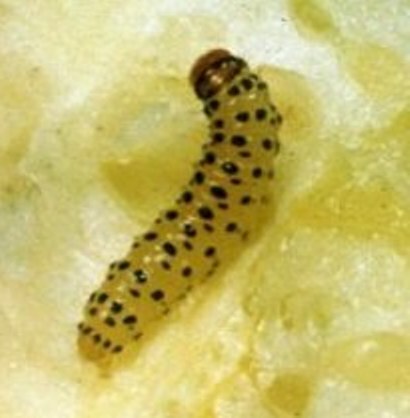 Feeding characteristics: This borer will attack the cucumber, melon, pumpkin and squash plants by entering the developing buds and fruits. One worm may attack several buds or fruits. Controls: Open the infested stem by making a slit and remove the borer. If the stem is not too far damaged, heap soil over the damaged area to encourage rooting.